Internal storage areas in the computer The term memory identifies data storage that comes in the form of chips, and the word storage is used for memory that exists on tapes or disks. Moreover, the term memory is usually used as a shorthand for physical memory, which refers to the actual chips capable of holding data. Some computers also use virtual memory, which expands physical memory onto a hard disk. ROM or Read Only Memory, Computers almost always contain a small amount of read-only memory that holds instructions for starting up the computer. Unlike RAM, ROM cannot be written to. It is non-volatile which means once you turn off the computer the information is still there. PROM, short for programmable read-only memory A PROM is a memory chip on which data can be written only once. Once a program has been written onto a PROM, it remains there forever. Unlike RAM, PROM's retain their contents when the computer is turned off. The difference between a PROM and a ROM (read-only memory) is that a PROM is manufactured as blank memory, whereas a ROM is programmed during the manufacturing process. To write data onto a PROM chip, you need a special device called a PROM programmer or PROM burner. The process of programming a PROM is sometimes called burning the PROM. EPROM (erasable programmable read-only memory) is a special type of PROM that can be erased by exposing it to ultraviolet light. Once it is erased, it can be reprogrammed. An EEPROM is similar to a PROM, but requires only electricity to be erased. EEPROM- Acronym for electrically erasable programmable read-only memory. Pronounced double-ee-prom or e-e-prom, an EEPROM is a special type of PROM that can be erased by exposing it to an electrical charge. Like other types of PROM, EEPROM retains its contents even when the power is turned off. Also like other types of ROM, EEPROM is not as fast as RAM. EEPROM is similar to flash memory (sometimes called flash EEPROM). The principal difference is that EEPROM requires data to be written or erased one byte at a time whereas flash memory allows data to be written or erased in blocks. This makes flash memory faster. RAM (Random Access Memory) is a temporary (Volatile) storage area utilized by the CPU. Before a program can be ran the program is loaded into the memory which allows the CPU direct access to the program. SRAM Short for static random access memory, and pronounced ess-ram. SRAM is a type of memory that is faster and more reliable than the more common DRAM (dynamic RAM). The term static is derived from the fact that it doesn't need to be refreshed like dynamic RAM. DRAM stands for dynamic random access memory, a type of memory used in most personal computers. SO-DIMM Short for Small Outline DIMM, a small version of a DIMM used commonly in notebook computers. 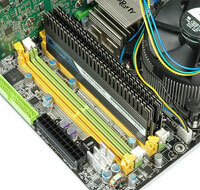 72 supports 32bit and 144 and 200 SO-DIMM pins supports a full 64-bit transfer. Micro-DIMM Short for Micro Dual Inline Memory Module, a competing memory used on laptops, mostly supports 144 and 172 pins. SIMM Acronym for single in-line memory module, a small circuit board that can hold a group of memory chips. Typically, SIMM's holds up 8 (on Macintoshes) or 9 (on PCs) RAM chips. On PCs, the ninth chip is often used for parity error checking. Unlike memory chips, SIMM's is measured in bytes rather than bits. SIMM's is easier to install than individual memory chips. A SIMM is either 30 or 72 pins. FPM RAM Short for Fast Page Mode RAM, a type of Dynamic RAM (DRAM) that allows faster access to data in the same row or page. Page-mode memory works by eliminating the need for a row address if data is located in the row previously accessed. It is sometimes called page mode memory. 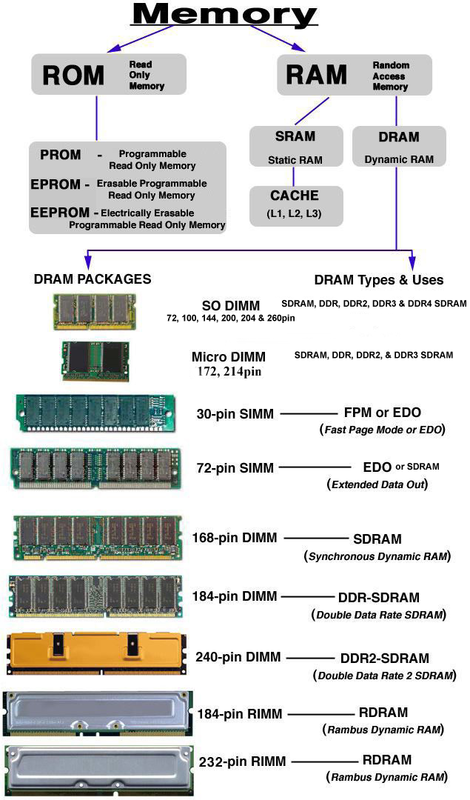 EDO DRAM Short for Extended Data Output Dynamic Random Access Memory, a type of DRAM that is faster than conventional DRAM. Unlike conventional DRAM which can only access one block of data at a time, EDO RAM can start fetching the next block of memory at the same time that it sends the previous block to the CPU. DIMM Short for dual in-line memory module, a small circuit board that holds memory chips. A single in-line memory module (SIMM) has a 32-bit path to the memory chips whereas a DIMM has 64-bit path. Because the Pentium processor requires a 64-bit path to memory, you need to install SIMM's two at a time. With DIMM's, you can install memory one DIMM at a time. A DIMM contains 168 pins. DDR SDRAM Short for Double Data Rate-Synchronous DRAM, a type of SDRAM that supports data transfers on both edges of each clock cycle, effectively doubling the memory chip's data throughput. DDR-SDRAM is also called SDRAM II. RDRAM Short for Rambus DRAM, a type of memory (DRAM) developed by Rambus, Inc. In 1997, Intel announced that it would license the Rambus technology for use on its future motherboards, thus making it the likely de facto standard for memory architectures. 1. The first thing you do is open the plastic retaining clips on each side of slots you are going to use. 3. Holding the module upright press down both ends. 4. When the module is correctly seated, retaining clips should lock automatically.